KLM and Air France are at it again, offering some deep discounts on travel to Europe, on dates as far away as mid 2016. This time it's from Toronto to Zagreb, Croatia (ZAG) - a European destination that's usually pricier than most in terms of airfare. This is nearly half of what it should be. And no, that is not Zagreb in the picture (it's a place called Dugi Otok). Head to the coast and the beautiful islands. The May & June 2016 dates are the most interesting! Click on the departure date box to open up the calendar view and try different dates, to look for combinations that come up with $515. However, you can't actually book this price through Google Flights. Nor are these prices showing up on KLM's own website (this has happened a lot recently). Or, you can also go to CheapOAir, RedTag, or FlightHub, although ITravel2000 seems to be about $10-$15 cheaper than the others. 3. Search for a flight from Toronto to Zagreb, Croatia (ZAG) using your dates from above. Where to stay in Croatia? The following AirBNB links will lead you to some great deals on places to stay in Croatia for under $99 CAD/night for 2 people. Or have a look on VRBO. Croatia has a ton of great owner-direct rental properties. 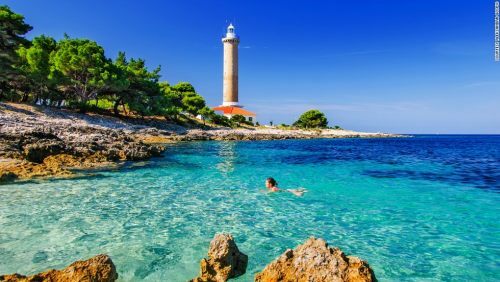 toronto, yyz, flight deals, europe, southern europe, central europe, balkans, southeastern europe, zagreb, croatia, zag, klm, air france and croatia airlines. 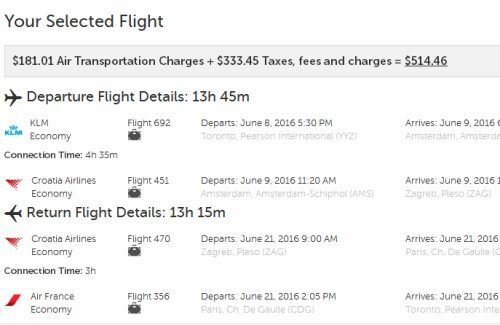 2 Responses to "Toronto to Zagreb, Croatia - $514 CAD roundtrip including taxes | all the way up to June 2016"
Booked! $1,089 CAD for 2 people ($545 a person), June 8 - July 1. This is by far the cheapest price I've found in the past 11 years, and I go there almost every year. I booked through ITravel2000. The weather is beautiful this time of year. There are also fewer tourists than normal, and the days are long and warm. We booked for mid May until mid June for 5 weeks. TIP: You can throw in a Paris return for $533 (Toronto - Zagreb, Paris - Toronto). We're going to travel through a number of countries so we don't have to double back to Croatia to fly out. You can also do Toronto - Zagreb, Zagreb - Paris, Paris - Toronto for $560 (3 flights)!